"Arminism" and "Arminians" redirect here. They should not be confused with, respectively, Armanism and Armenians. Arminianism is a branch of Protestantism based on the theological ideas of the Dutch Reformed theologian Jacobus Arminius (1560–1609) and his historic supporters known as Remonstrants. His teachings held to the five solae of the Reformation, but they were distinct from particular teachings of Martin Luther, Huldrych Zwingli, John Calvin, and other Protestant Reformers. 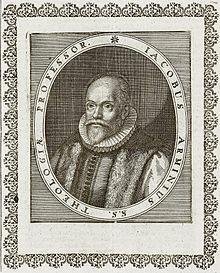 Jacobus Arminius (Jakob Harmenszoon) was a student of Theodore Beza (Calvin's successor) at the Theological University of Geneva. Arminianism is known to some as a soteriological diversification of Protestant Calvinist Christianity; to others, Arminianism is a reclamation of early Church theological consensus. Believers are able to resist sin through Grace, and Christ will keep them from falling; but whether they are beyond the possibility of ultimately forsaking God or "becoming devoid of grace ... must be more particularly determined from the Scriptures." "These points", note Keith D. Stanglin and Thomas H. McCall, "are consistent with the views of Arminius; indeed, some come verbatim from his Declaration of Sentiments. Those who signed this remonstrance and others who supported its theology have since been known as Remonstrants." Many Christian denominations have been influenced by Arminian views on the will of man being freed by Grace prior to regeneration, notably the Baptists in the 16th century, the Methodists in the 18th century and the Seventh-day Adventist Church in the 19th century. Some falsely assert that Universalists and Unitarians in the 18th and 19th centuries were theologically linked with Arminianism. Denominations such as the Anabaptists (beginning in 1525), Waldensians (pre-Reformation), and other groups prior to the Reformation have also affirmed that each person may choose the contingent response of either resisting God's grace or yielding to it. The original beliefs of Jacobus Arminius himself are commonly defined as Arminianism, but more broadly, the term may embrace the teachings of Hugo Grotius, John Wesley, and others as well. Classical Arminianism, to which Arminius is the main contributor, and Wesleyan Arminianism, to which John Wesley is the main contributor, are the two main schools of thought. Wesleyan Arminianism is often identical with Methodism. Some schools of thought, notably semipelagianism—which teaches that the first step of Salvation is by human will—are confused as being Arminian in nature. But classical Arminianism holds that the first step of Salvation is solely the grace of God. Historically, the Council of Orange (529) condemned semi-Pelagian thought (as well as Supralapsarian Calvinism), and is accepted by some as a document which can be understood as teaching a doctrine between Augustinian thought and semi-Pelagian thought, relegating Arminianism to the orthodoxy of the early Church fathers. The two systems of Calvinism and Arminianism share both history and many doctrines, and the history of Christian theology. Arminianism is related to Calvinism historically. However, because of their differences over the doctrines of divine predestination and election, many people view these schools of thought as opposed to each other. The distinction is whether God allows His desire to save all to be resisted by an individual's will (in the Arminian doctrine) or if God's grace is irresistible and limited to only some (in Calvinism). Put another way, is God's sovereignty shown, in part, through His allowance of free decisions? Some Calvinists assert that the Arminian perspective presents a synergistic system of Salvation and therefore is not only by Grace, while Arminians firmly reject this conclusion. Many consider the theological differences to be crucial differences in doctrine, while others find them to be relatively minor. Jacobus Arminius was a Dutch pastor and theologian in the late 16th and early 17th centuries. He was taught by Theodore Beza, Calvin's hand-picked successor, but after examination of the scriptures, he rejected his teacher's theology that it is God who unconditionally elects some for salvation. Instead Arminius proposed that the election of God was of believers, thereby making it conditional on faith. Arminius's views were challenged by the Dutch Calvinists, especially Franciscus Gomarus, but Arminius died before a national synod could occur. Arminius's followers, not wanting to adopt their leader's name, called themselves the Remonstrants. When Arminius died before he could satisfy Holland's State General's request for a 14-page paper outlining his views, the Remonstrants replied in his stead crafting the Five articles of Remonstrance. After some political maneuvering, the Dutch Calvinists were able to convince Prince Maurice of Nassau to deal with the situation. Maurice systematically removed Arminian magistrates from office and called a national synod at Dordrecht. 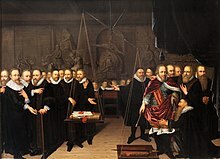 This Synod of Dort was open primarily to Dutch Calvinists (Arminians were excluded) with Calvinist representatives from other countries, and in 1618 published a condemnation of Arminius and his followers as heretics. Part of this publication was the famous Five points of Calvinism in response to the five articles of Remonstrance. The debate between Calvin's followers and Arminius's followers is distinctive of post-Reformation church history. The emerging Baptist movement in 17th-century England, for example, was a microcosm of the historic debate between Calvinists and Arminians. The first Baptists—called "General Baptists" because of their confession of a "general" or unlimited atonement—were Arminians. The Baptist movement originated with Thomas Helwys, who left his mentor John Smyth (who had moved into shared belief and other distinctives of the Dutch Waterlander Mennonites of Amsterdam) and returned to London to start the first English Baptist Church in 1611. Later General Baptists such as John Griffith, Samuel Loveday, and Thomas Grantham defended a Reformed Arminian theology that reflected more the Arminianism of Arminius than that of the later Remonstrants or the English Arminianism of Arminian Puritans like John Goodwin or Anglican Arminians such as Jeremy Taylor and Henry Hammond. The General Baptists encapsulated their Arminian views in numerous confessions, the most influential of which was the Standard Confession of 1660. In the 1640s the Particular Baptists were formed, diverging strongly from Arminian doctrine and embracing the strong Calvinism of the Presbyterians and Independents. Their robust Calvinism was publicized in such confessions as the London Baptist Confession of 1644 and the Second London Confession of 1689. The London Confession of 1689 was later used by Calvinistic Baptists in America (called the Philadelphia Baptist Confession), whereas the Standard Confession of 1660 was used by the American heirs of the English General Baptists, who soon came to be known as Free Will Baptists. This same dynamic between Arminianism and Calvinism can be seen in the heated discussions between friends and fellow Anglican ministers John Wesley and George Whitefield. Wesley was a champion of Arminian teachings, defending his soteriology in a periodical titled The Arminian and writing articles such as Predestination Calmly Considered. He defended Arminianism against charges of semi-Pelagianism, holding strongly to beliefs in original sin and total depravity. At the same time, Wesley attacked the determinism that he claimed characterized unconditional election and maintained a belief in the ability to lose salvation. Wesley also clarified the doctrine of prevenient grace and preached the ability of Christians to attain to perfection (fully mature, not "sinlessness"). While Wesley freely made use of the term "Arminian," he did not self-consciously root his soteriology in the theology of Arminius but was highly influenced by 17th-century English Arminianism and thinkers such as John Goodwin, Jeremy Taylor and Henry Hammond of the Anglican "Holy Living" school, and the Remonstrant Hugo Grotius. Advocates of both Arminianism and Calvinism find a home in many Protestant denominations, and sometimes both exist within the same denomination. Faiths leaning at least in part in the Arminian direction include Methodists, Free Will Baptists, Christian Churches and Churches of Christ, General Baptists, the Seventh-day Adventist Church, Church of the Nazarene, The Wesleyan Church, The Salvation Army, Conservative Mennonites, Old Order Mennonites, Amish and Charismatics. Denominations leaning in the Calvinist direction are grouped as the Reformed churches and include Particular Baptists, Reformed Baptists, Presbyterians, and Congregationalists. The majority of Southern Baptists, including Billy Graham, accept Arminianism with an exception allowing for a doctrine of perseverance of the saints ("eternal security"). Many see Calvinism as growing in acceptance, and some prominent Reformed Baptists, such as Albert Mohler and Mark Dever, have been pushing for the Southern Baptist Convention to adopt a more Calvinistic orientation (no Baptist church is bound by any resolution adopted by the Southern Baptist Convention). Lutherans espouse a view of salvation and election distinct from both the Calvinist and Arminian schools of soteriology. The current scholarly support for Arminianism is wide and varied. One particular thrust is a return to the teachings of Arminius. F. Leroy Forlines, Robert Picirilli, Stephen Ashby and Matthew Pinson (see citations) are four of the more prominent supporters. Forlines has referred to this type of Arminianism as "Classical Arminianism," while Picirilli, Pinson, and Ashby have termed it "Reformation Arminianism" or "Reformed Arminianism." Through Methodism, Wesley's teachings also inspire a large scholarly following, with vocal proponents including J. Kenneth Grider, Stanley Hauerwas, Thomas Oden, Thomas Jay Oord, and William Willimon. Recent influence of the New Perspective on Paul movement has also reached Arminianism — primarily through a view of corporate election. The New Perspective scholars propose that the 1st-century Second Temple Judaism understood election primarily as national (Israelites) and racial (Jews), not as individual. Their conclusion is thus that Paul's writings on election should be interpreted in a similar corporate light. Atonement is intended for all: Jesus's death was for all people, Jesus draws all people to himself, and all people have opportunity for salvation through faith. Jesus's death satisfies God's justice: The penalty for the sins of the elect is paid in full through Jesus's work on the cross. Thus Christ's atonement is intended for all, but requires faith to be effected. Arminius states that "Justification, when used for the act of a Judge, is either purely the imputation of righteousness through mercy… or that man is justified before God… according to the rigor of justice without any forgiveness." Stephen Ashby clarifies: "Arminius allowed for only two possible ways in which the sinner might be justified: (1) by our absolute and perfect adherence to the law, or (2) purely by God's imputation of Christ's righteousness." Grace is resistible: God takes initiative in the salvation process and his grace comes to all people. This grace (often called prevenient or pre-regenerating grace) acts on all people to convince them of the Gospel, draw them strongly towards salvation, and enable the possibility of sincere faith. Picirilli states that "indeed this grace is so close to regeneration that it inevitably leads to regeneration unless finally resisted." The offer of salvation through grace does not act irresistibly in a purely cause-effect, deterministic method but rather in an influence-and-response fashion that can be both freely accepted and freely denied. Man has a freed will to respond or resist: Free will is granted and limited by God's sovereignty, but God's sovereignty allows all men the choice to accept the Gospel of Jesus through faith, simultaneously allowing all men to resist. Christ's righteousness is imputed to the believer: Justification is sola fide (by faith alone). When individuals repent and believe in Christ (saving faith), they are regenerated and brought into union with Christ, whereby the death and righteousness of Christ are imputed to them for their justification before God. Eternal security is also conditional: All believers have full assurance of salvation with the condition that they remain in Christ. Salvation is conditioned on faith, therefore perseverance is also conditioned. Apostasy (turning from Christ) is only committed through a deliberate, willful rejection of Jesus and renunciation of saving faith. Such apostasy is irremediable. On whether a believer could commit apostasy (i.e., desert Christ by cleaving again to this evil world, losing a good conscience, or by failing to hold on to sound doctrine), Arminius declared that this matter required further study in the Scriptures. Nevertheless, Arminius believed the Scriptures taught that believers are graciously empowered by Christ and the Holy Spirit "to fight against Satan, sin, the world and their own flesh, and to gain the victory over these enemies." Furthermore, Christ and the Spirit are ever present to aid and assist believers through various temptations. But this security was not unconditional but conditional—"provided they [believers] stand prepared for the battle, implore his help, and be not wanting to themselves, Christ preserves them from falling." Arminius goes on to say, "I never taught that a true believer can, either totally or finally fall away from the faith, and perish; yet I will not conceal, that there are passages of scripture which seem to me to wear this aspect; and those answers to them which I have been permitted to see, are not of such a kind as to approve themselves on all points to my understanding." After the death of Arminius in 1609, the Remonstrants maintained their leader's view on conditional security and his uncertainty regarding the possibility of believers committing apostasy. This is evidenced in the fifth article drafted by its leaders in 1610. However, sometime between 1610, and the official proceeding of the Synod of Dort (1618), the Remonstrants became fully persuaded in their minds that the Scriptures taught that a true believer was capable of falling away from faith and perishing eternally as an unbeliever. They formalized their views in "The Opinion of the Remonstrants" (1618). Picirilli remarks: "Ever since that early period, then, when the issue was being examined again, Arminians have taught that those who are truly saved need to be warned against apostasy as a real and possible danger." John Wesley has historically been the most influential advocate for the teachings of Arminian soteriology. Wesley thoroughly agreed with the vast majority of what Arminius himself taught, maintaining strong doctrines of original sin, total depravity, conditional election, prevenient grace, unlimited atonement, and the possibility of apostasy. Wesley's atonement is a hybrid of the penal substitution theory and the governmental theory of Hugo Grotius, a lawyer and one of the Remonstrants. Steven Harper states, "Wesley does not place the substitionary element primarily within a legal framework...Rather [his doctrine seeks] to bring into proper relationship the 'justice' between God's love for persons and God's hatred of sin...it is not the satisfaction of a legal demand for justice so much as it is an act of mediated reconciliation." Wesley fully accepted the Arminian view that genuine Christians could apostatize and lose their salvation, as his famous sermon "A Call to Backsliders" clearly demonstrates. Harper summarizes as follows: "the act of committing sin is not in itself ground for the loss of salvation...the loss of salvation is much more related to experiences that are profound and prolonged. Wesley sees two primary pathways that could result in a permanent fall from grace: unconfessed sin and the actual expression of apostasy." Wesley disagrees with Arminius, however, in maintaining that such apostasy was not final. When talking about those who have made "shipwreck" of their faith (1 Tim 1:19), Wesley claims that "not one, or a hundred only, but I am persuaded, several thousands...innumerable are the instances...of those who had fallen but now stand upright." According to Wesley's teaching, Christians could attain a state of practical perfection, meaning a lack of all voluntary sin by the empowerment of the Holy Spirit, in this life. Christian perfection (or entire sanctification), according to Wesley, is "purity of intention, dedicating all the life to God" and "the mind which was in Christ, enabling us to walk as Christ walked." It is "loving God with all our heart, and our neighbor as ourselves". It is "a restoration not only to the favour, but likewise to the image of God," our "being filled with the fullness of God". Wesley was clear that Christian perfection did not imply perfection of bodily health or an infallibility of judgment. It also does not mean we no longer violate the will of God, for involuntary transgressions remain. Perfected Christians remain subject to temptation, and have continued need to pray for forgiveness and holiness. It is not an absolute perfection but a perfection in love. Furthermore, Wesley did not teach a salvation by perfection, but rather says that, "Even perfect holiness is acceptable to God only through Jesus Christ." Since the time of Arminius his name has come to represent a very large variety of beliefs. Some of these beliefs, such as Pelagianism and semi-Pelagianism (see below) are not considered to be within Arminian orthodoxy and are dealt with elsewhere. Some doctrines, however, do adhere to the Arminian foundation and, while minority views, are highlighted below. The doctrine of open theism states that God is omnipresent, omnipotent, and omniscient, but differs on the nature of the future. Open theists claim that the future is not completely determined (or "settled") because people have not made their free decisions yet. God therefore knows the future partially in possibilities (human free actions) rather than solely certainties (divinely determined events). As such, open theists resolve the issue of human free will and God's sovereignty by claiming that God is sovereign because he does not ordain each human choice, but rather works in cooperation with his creation to bring about his will. This notion of sovereignty and freedom is foundational to their understanding of love since open theists believe that love is not genuine unless it is freely chosen. The power of choice under this definition has the potential for as much harm as it does good, and open theists see free will as the best answer to the problem of evil. Well-known proponents of this theology are Greg Boyd, Clark Pinnock, Thomas Jay Oord, William Hasker, and John E. Sanders. God purposely exercises his sovereignty in ways that do not illustrate its extent – in other words, He has the power and authority to predetermine salvation but he chooses to apply it through different means. Corporate election draws support from a similar concept of corporate election found in the Old Testament and Jewish law. Indeed most biblical scholarship is in agreement that Judeo-Greco-Roman thought in the 1st century was opposite of the Western world's "individual first" mantra – it was very collectivist or communitarian in nature. Identity stemmed from membership in a group more than individuality. According to Romans 9–11, supporters claim, Jewish election as the chosen people ceased with their national rejection of Jesus as Messiah. As a result of the new covenant, God's chosen people are now the corporate body of Christ, the church (sometimes called spiritual Israel – see also Covenant theology). The pastor and theologian Brian Abasciano claims "What Paul says about Jews, Gentiles, and Christians, whether of their place in God’s plan, or their election, or their salvation, or how they should think or behave, he says from a corporate perspective which views the group as primary and those he speaks about as embedded in the group. These individuals act as members of the group to which they belong, and what happens to them happens by virtue of their membership in the group." These scholars also maintain that Jesus was the only human ever elected and that individuals must be "in Christ" (Eph 1:3–4) through faith to be part of the elect. This was, in fact, Swiss Reformed theologian, Karl Barth's, understanding of the doctrine of election. Joseph Dongell, professor at Asbury Theological Seminary, states "the most conspicuous feature of Ephesians 1:3–2:10 is the phrase 'in Christ', which occurs twelve times in Ephesians 1:3–14 alone...this means that Jesus Christ himself is the chosen one, the predestined one. Whenever one is incorporated into him by grace through faith, one comes to share in Jesus' special status as chosen of God." Markus Barth illustrates the inter-connectedness: "Election in Christ must be understood as the election of God's people. Only as members of that community do individuals share in the benefits of God's gracious choice." Understanding Arminianism is aided by understanding the theological alternatives: Pelagianism, Semi-Pelagianism, Lutheranism, and Calvinism. Arminianism, like any major belief system, is frequently misunderstood both by critics and would-be supporters. Arminian beliefs compared to other Protestants. Arminianism is Pelagian (or Semi-Pelagian), denying original sin and total depravity – No system of Arminianism founded on Arminius or Wesley denies original sin or total depravity; both Arminius and Wesley strongly affirmed that man's basic condition is one in which he cannot be righteous, understand God, or seek God. Many Calvinist critics of Arminianism, both historically and currently, claim that Arminianism condones, accepts, or even explicitly supports Pelagianism or Semi-Pelagianism. Arminius referred to Pelagianism as "the grand falsehood" and stated that he "must confess that I detest, from my heart, the consequences [of that theology]." David Pawson, a British pastor, decries this association as "libelous" when attributed to Arminius' or Wesley's doctrine. Indeed, most Arminians reject all accusations of Pelagianism; nonetheless, primarily due to Calvinist opponents, the two terms remain intertwined in popular usage. Arminianism denies Jesus' substitutionary payment for sins – Both Arminius and Wesley believed in the necessity and sufficiency of Christ's atonement through penal substitution. Arminius held that God's justice was satisfied individually, while Hugo Grotius and many of Wesley's followers taught that it was satisfied governmentally. Nature of grace – Arminians believe that, through grace, God restores free will concerning salvation to all humanity, and each individual, therefore, is able either to accept the Gospel call through faith or resist it through unbelief. Calvinists hold that God's grace to enable salvation is given only to the elect and irresistibly leads to salvation. Extent of the atonement – Arminians, along with four-point Calvinists or Amyraldians, hold to a universal drawing and universal extent of atonement instead of the Calvinist doctrine that the drawing and atonement is limited in extent to the elect only, which many Calvinists prefer to call 'particular redemption'. Both sides (with the exception of hyper-Calvinists) believe the invitation of the gospel is universal and "must be presented to everyone [they] can reach without any distinction." Perseverance in faith – Arminians believe that future salvation and eternal life is secured in Christ and protected from all external forces but is conditional on remaining in Christ and can be lost through apostasy. Traditional Calvinists believe in the doctrine of the perseverance of the saints, which says that because God chose some unto salvation and actually paid for their particular sins, he keeps them from apostasy and that those who do apostatize were never truly regenerated (that is, born again) or saved. Non-traditional Calvinists and other evangelicals advocate the similar but distinct doctrine of eternal security that teaches if a person was once saved, his or her salvation can never be in jeopardy, even if the person completely apostatizes. ^ See Jacob Arminius: Theologian of Grace (New York: Oxford University Press, 2012), 190. ^ Stanglin and McCall, 160. ^ F. Leroy Forlines, Classical Arminianism: A Theology of Salvation, ed. J. Matthew Pinson (Nashville: Randall House Publications, 2011), 20-24. ^ "Southern Baptist Convention > SBC Search". Retrieved 16 October 2016. ^ a b Works of Arminius, 2:219-220. ^ Works of Arminius, 2:219-220. This seems to fit with Arminius’ other statements on the need for perseverance in faith. For example: "God resolves to receive into favor those who repent and believe, and to save in Christ, on account of Christ, and through Christ, those who persevere [in faith], but to leave under sin and wrath those who are impenitent and unbelievers, and to condemn them as aliens from Christ" (Works of Arminius, 2:465; cf. 2:466). In another place he writes: "[God] wills that they, who believe and persevere in faith, shall be saved, but that those, who are unbelieving and impenitent, shall remain under condemnation" (Works of Arminius, 3:412; cf. 3:413). ^ Works of Arminius, 2:219-220. William Nichols notes: "Arminius spoke nearly the same modest words when interrogated on this subject in the last Conference which he had with Gomarus [a Calvinist], before the states of Holland, on the 12th of Aug. 1609, only two months prior to his decease" (Works of Arminius, 1:665). B.J. Oropeza says, "Although Arminius denied having taught final apostasy in his Declaration of Sentiments, in the Examination of the Treatise of Perkins on the Order and Mode of Predestination he writes that a person who is being 'built' into the church of Christ may resist the continuation of this process. Concerning the believers, 'It may suffice to encourage them, if they know that no power or prudence can dislodge them from the rock, unless they of their own will forsake their position.' [Works of Arminius, 3:455, cf. 1:667] A believing member of Christ may become slothful, give place to sin, and gradually die altogether, ceasing to be a member. [Works of Arminius, 3:458] The covenant of God (Jeremiah 23) 'does not contain in itself an impossibility of defection from God, but a promise of the gift of fear, whereby they shall be hindered from going away from God so long as that shall flourish in their hearts.' If there is any consistency in Arminius' position, he did not seem to deny the possibility of falling away" (Paul and Apostasy, 16). ^ Points three and four in the fifth article read: True believers can fall from true faith and can fall into such sins as cannot be consistent with true and justifying faith; not only is it possible for this to happen, but it even happens frequently. True believers are able to fall through their own fault into shameful and atrocious deeds, to persevere and to die in them; and therefore finally to fall and to perish. (Peter Y. DeJong, Crisis in the Reformed Churches: Essays in Commemoration of the Great Synod of Dordt, 1618-1619, 220ff). For more on the Remonstrant view regarding apostasy see the External Link articles: The Opinions of the Remonstrants (1618); and The Arminian Confession of 1621 and Apostasy. ^ Grace, Faith, Free Will, 198. ^ Picirilli, Grace, Faith, Free Will, 40 – Picirilli actually objects so strongly to the link between Arminianism and Open theism that he devotes an entire section to his objections. See 59ff. Forlines, F. Leroy (2011). Classical Arminianism: A Theology of Salvation. Nashville: Randall House. ISBN 0-89265-607-7. Forlines, F. Leroy (2001). The Quest for Truth: Answering Life's Inescapable Questions. Nashville: Randall House. ISBN 0-89265-864-9. Forster, Roger (2000). God's Strategy in Human History. Wipf & Stock Publishers. ISBN 1-57910-273-5. Klein, William W. (1990). The New Chosen People. A Corporate View of Election. Grand Rapids: Zondervan. ISBN 0-310-51251-4. Mcgonigle, Herbert (2001). Sufficient Saving Grace. Carlisle: Paternoster. ISBN 1-84227-045-1. Olson, Roger (2006). Arminian Theology: Myths and Realities. Downers Grove: IVP Academic. ISBN 0-8308-2841-9. Pawson, David (1996). Once Saved, Always Saved? A Study in Perseverance and Inheritance. London: Hodder & Stoughton. ISBN 0-340-61066-2. Picirilli, Robert (2002). Grace, Faith, Free Will: Contrasting Views of Salvation. Nashville: Randall House. ISBN 0-89265-648-4. Pinson, J. Matthew (2003). "The Nature of Atonement in the Theology of Jacobus Arminius" (PDF). Journal of the Evangelical Theological Society. 53: 173–185. Pinson, J. Matthew (2003). "Will the Real Arminius Please Stand Up? A Study of the Theology of Jacobus Arminius in Light of His Interpreters" (PDF). Integrity: A Journal of Christian Thought. 2: 121–139. Pinson, J. Matthew, ed. (2002). Four Views on Eternal Security. Grand Rapids: Zondervan. ISBN 0-310-23439-5. Satama, Mikko (2009). "Aspects of Arminian Soteriology in Methodist-Lutheran Ecumenical Dialogues in 20th and 21st Century" Master's Thesis, University of Helsinki, Faculty of Theology. Shank, Robert (1989). Elect in the Son. Minneapolis: Bethany House Publishers. ISBN 1-55661-092-0. Walls, Jerry L.; Dongell, Joseph R. (2004). Why I Am Not a Calvinist. Downers Grove: InterVarsity Press. ISBN 0-8308-3249-1. Wesley, John. "The Question, 'What Is an Arminian?' Answered by a Lover of Free Grace"